The New Moon in Aries falls in conjunction with Uranus and thus merges with the powerful long-term t-square pattern formed by Jupiter, Uranus and Pluto. We are at a threshold of a new phase, slipping on uncharted routes, to something we haven’t experienced before. A New Moon (the conjunction of the Sun and the Moon) always starts a new lunation cycle, and the Sun in Aries, in the first sign of the zodiac, means the beginning of a new solar cycle. Uranus adds the surprise factor to this lunation. Last week the long awaited news was announced: the astronomers have found an icy little planet in Sedna’s region. Sedna is not alone anymore! The new minor planet doesn’t have a name yet, but for the time being we can call it VP – a shortening from 2012 VP113 – or Biden, as the discovery team has nicknamed it. Sedna was discovered ten years ago. It is the coldest and most distant place known in the Solar System, so it was named after the Inuit goddess of the sea, who lives at the bottom of the Arctic Ocean. All this time the astronomers have been searching for more objects like Sedna, and now they have found another, which raises the hope that there are even more of them. Sedna is at 23+ degrees of Taurus at the moment, right opposite Saturn in Scorpio. VP is also in Taurus, somewhere in Sedna’s vicinity. Yesterday in Finland during The Earth Hour the lights were turned off with a focus on raising awareness about climate change in the Arctic. Let’s hope that the newcomer brings the change for the better. 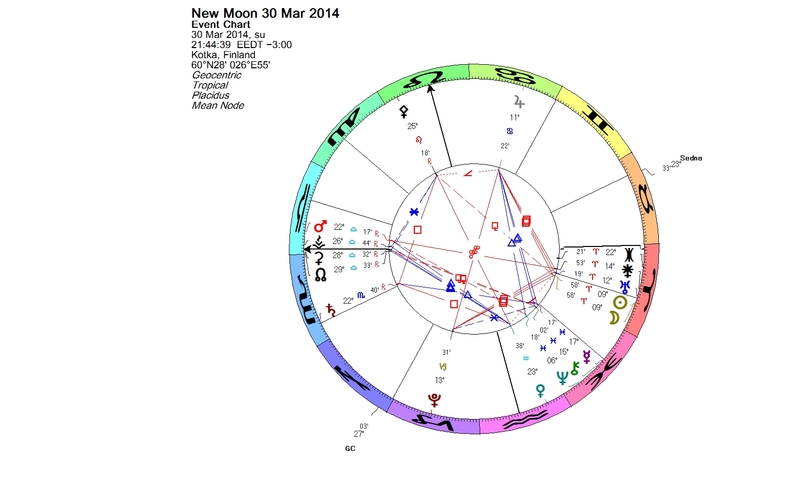 This entry was posted on Sunday, March 30th, 2014 at 8:46 pm	and is filed under New Moon. You can follow any responses to this entry through the RSS 2.0 feed. You can leave a response, or trackback from your own site.